With over 73,000 people diagnosed with bladder cancer every year, increased awareness and support is needed. 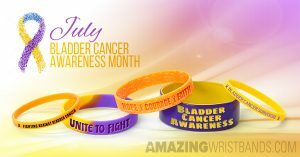 If you’re organizing and bladder cancer awareness event or just want to show support for someone you care about, bladder cancer wristbands are the perfect solution. Check Amazing Wristbands to get your wish bracelets designed and shipped amazingly fast! National Bladder Cancer Awareness month is in May. Many events are scheduled around this time to bring nationwide attention to treatments and research related to bladder cancer. Your bladder cancer wristbands for an event can include the event name and website. Use your event wristbands to promote the event, help people gain entry to the event, or sell them at the event to raise funds.These bracelets can also be used to show support or raise money for a single person’s battle against bladder cancer. These support wristbands can include the person’s name as well as a slogan or inspirational message. The colors orange and yellow are often used for bladder cancer awareness. 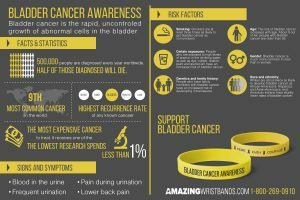 Bladder Cancer is the 6th most commonly diagnosed cancer in the U.S. It is the 4th most common cancer in men and 11th in women. In 2013, it's estimated that 15,000 people will die from bladder cancer. There are more than 520,000 bladder cancer survivors in the U.S.
As with many other cancers, detecting bladder cancer early is critical improves survival rates. The most common symptom of bladder cancer is blood in the urine. Men are more likely to be diagnosed with bladder cancer, but women are more likely to die of the disease. There have been no major advancements in the treatment of bladder cancer in the past 25 years. A specific cause for bladder cancer in not yet known, but smoking and chemical exposure are considered risk factors that may lead to the disease. Bladder Cancer has a recurrence rate of 50-80%. People who survive bladder cancer require life-long care and evaluation, making bladder cancer the most expensive cancer to treat on a per patient basis. 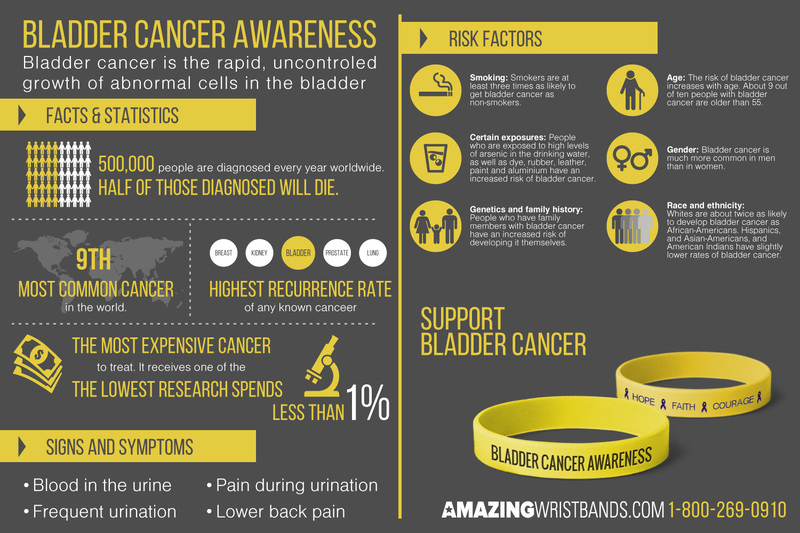 At AmazingWristbands.com, we offer 100% silicone for your bladder cancer wristbands. Choose from a variety of colors, including variations of orange or yellow, and add special effects such swirled or segmented colors, glitter, or glow in the dark. Use our online customizers to easily design your wristbands. We do not require a minimum quantity for our most popular wristband. Enjoy free shipping, free artwork, free design, and free color matching when you shop with us. Most orders are ready in 5 - 10 days, and rush delivery is available.